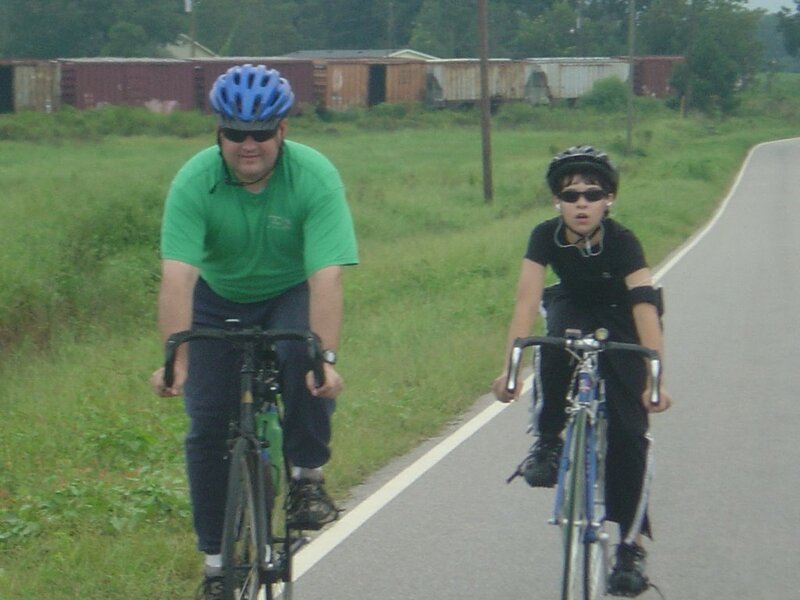 Every year about this time, the boys and I ride a 100K (62.5 miles) for Sheaves for Christ. This is a program that helps assist missionaries with vehicles. It also provides the opportunity for college-aged young men and women to gain scholarships to Bible colleges and the Urshan Graduate School of Theology. It also helps with a diversity of other youth programs that not only affect the nation but the world at large. In addition to this, it also provides the ability to start new churches in target areas within the US. We are on a countdown because we will be riding on September 9, 2006. We have been riding quite a bit this year already but we have stepped up our “training” in the last few weeks. Yesterday, we round 15 miles in 94 degree weather. It was a few hours after a major thunderstorm and so the humidity was at 74%. 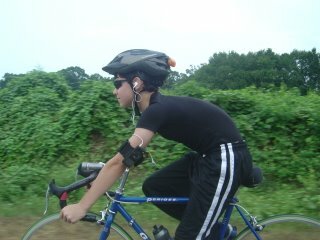 Needless to say, it was quite hot and humid! Justin, Nathan, and I need all the help that we can get to help make this effort a success for Sheaves for Christ. We would like to raise $5,000 in this 100k ride. I have set up a PayPal account so that you can give safely and securely online. You also will receive a receipt for your sponsor for tax purposes. I have been challenged by a pastor in Moulton, Alabama. Kenny Rogers is going to ride with us for the first time this year. 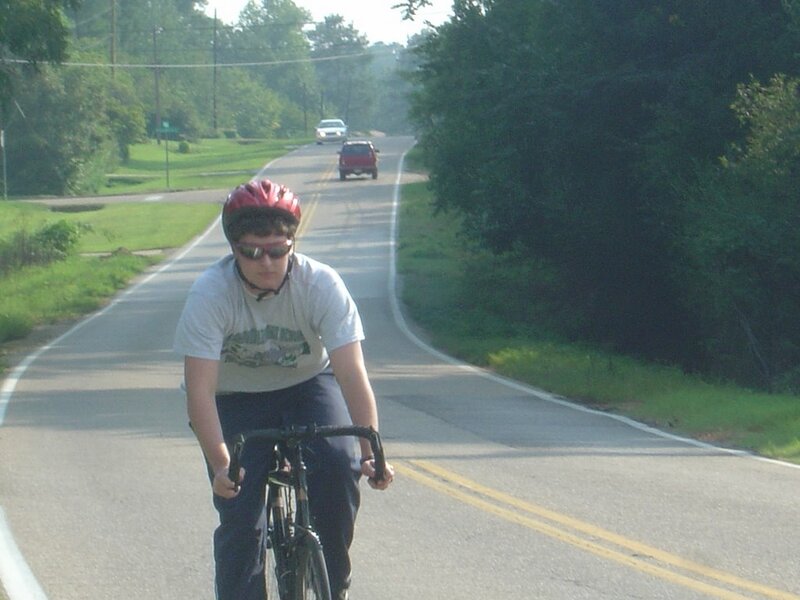 Also, my usual challenge from Mobile is my brother, Mark, who is now the Alabama District Youth President. I am already aware that he will be able to finish before I do but I would definitely like to raise more money than him or Bro. Rogers. 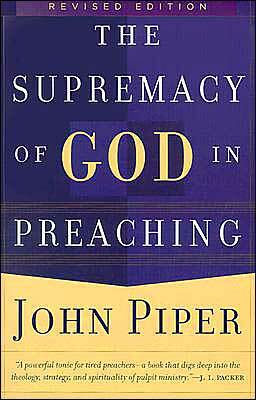 I am going to pick back up my reading list for pastors and ministers. Previously, I have mentioned some tools for personal growth and then a reading list by E. E. Jolley. This post will draw your attention to some very good tools that are specifically related to sermon preparation. In my estimation, the most challenging thing about preaching is that it is very weekly. Because preaching is very weekly, if one is not careful the preaching can be delivered very weakly. As one elder minister told me one time, “Sunday comes around pretty regular.” This is precisely what makes preaching so demanding. We have to take into consideration schedules that sometimes become filled uncontrollable circumstances and demands. I feel at times that a minister’s schedule is something that the enemy will use to try to dictate and control the amount of time we spend in the Word. Most ministers who are willing to be honest, feel that there are times when the preached Word literally cleared the fence and then there will be other times that he feels as if a strikeout was recorded. This powerful Word is being conveyed through earthen vessels (2 Cor. 4:7; 2 Tim. 2:20). Because the vessel is weak there will sometimes be a certain liability that comes with the delivery of the message. The message is not weak, if it is Word-centered, but the tool that God is using can sometimes not live up to its potential and fulfill the task. 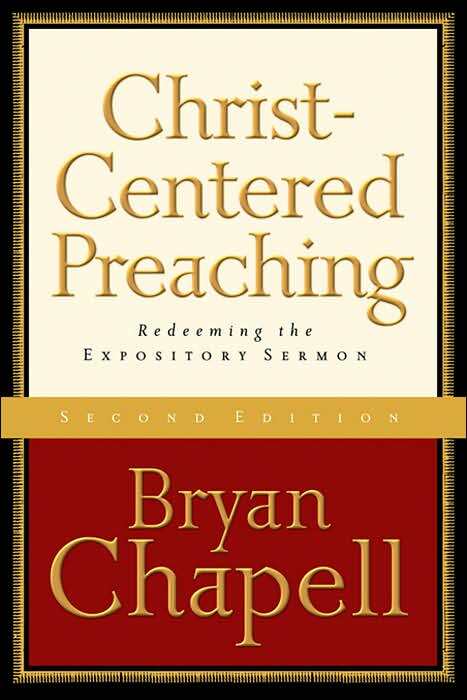 I am going to suggest some books for you that have to do with either putting the message together or in inspiring the man toward the task of preaching. We must be faithful and patient in what God leads us to preach to the Church that we serve. He can bring us the direction of the thought but then I believe it is my personal responsibility to dig and flesh out the message in the study. 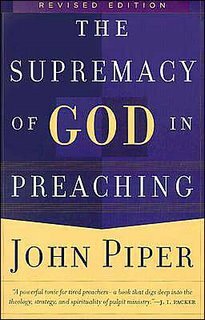 I will admit that this book was a little difficult for me but because it was required reading to get my license for the UPCI, I did read it. Robinson really tries to encourage the “Big Idea” concept of every single message. He encourages the preacher once the message is complete, to use one word to sum it up. What is the message about? Salvation, Faith, Prayer, etc. His book deals with selecting, studying, discovering, analyzing, formulating, determining, outlining, and then putting the meat on the bones of an outline. Preaching the Word is far more important than waiting on tables (I wrote this down back in the late 90’s. You might want to get Terry Shock’s message from BOTT 2006 entitled, “Accidentally Apostolic? Impossible!” and listen to it.). There is a power that comes through preaching that will never be replaced. Preaching will be a necessity either until death or the Rapture. I have a vast responsibility to preach the Word patiently, carefully, and routinely, whether I “feel” like it or not. I would hate to know that I had to go to a church that devalued preaching. The Bible is great literature. All of its diamonds do not lie exposed on the surface to be picked like flowers. Its richness will have to be mined out through hard spiritual and mental spadework. One man has told me that a pastor has been in a particular church for seven years and has preached through 27 or 30 books of the Bible during that period of time. William Barclay diagnosed the cause of spiritual malnutrition in a minister’s life when he wrote: “The more a man allows his mind to grow slack and lazy and flabby, the less the Holy Spirit can say to him. 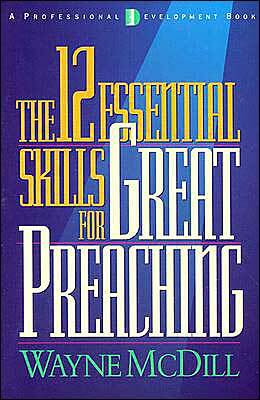 True preaching comes when the loving heart and the disciplined mind are laid at the disposal of the Holy Spirit.” Ultimately God is more interested in developing messengers than messages, and since the Holy Spirit confronts men primarily through the Bible, a preacher must learn to listen to God before he speaks for Him. 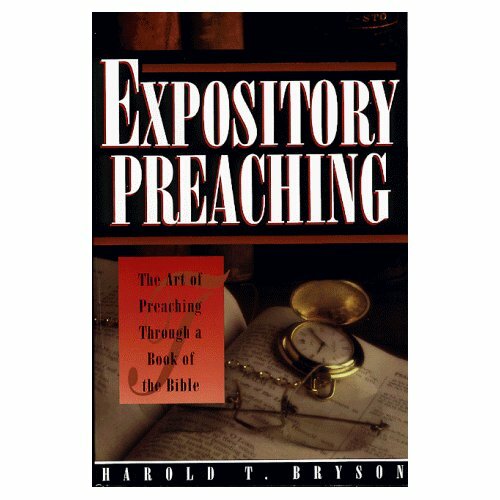 In my opinion, this is the best book on expository preaching that I have ever read. It literally walks you through the mechanics of preaching through a book of the Bible. 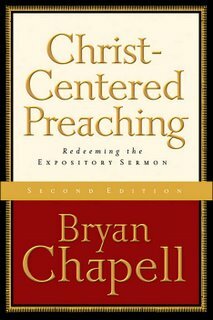 I realize that in Pentecostal circles that such preaching is not as popular as topical preaching. However, I am becoming increasingly convinced that this sort of preaching is the most practical and life building. By preaching verse-by-verse, it forces the minister to deal with the text and not be constantly reverting to his favorite “candysticks” and hobby horses. The Tests of Life -- Messages from 1 John -- This epistle revolves around three words: Light, Righteous, and Love. This is what helps us to go through the “tests” of life. From Acts -- Look at the Great Texts of Acts. Look at the Great People of Acts. Look at the Great Events in Acts. 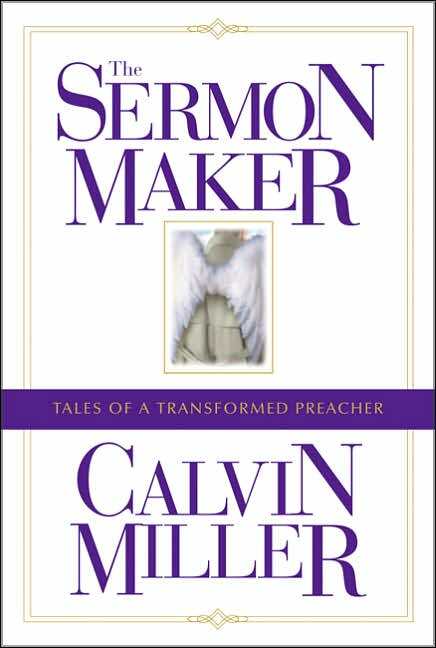 This book encourages the preacher to tell the story. Most of us like good stories and the Bible is full of stories that will provide a life lesson. To me the most helpful portion of this book had to do with the massive amount of authors and book titles that Larsen either recommended or listed for further evaluation. This book is literally loaded with fantastic seed thoughts. The Tyranny of Trifles -- On Mary and Martha. Luke 10:38-42. The Snare of Spiritual Familiarity -- Luke 4:14-30. Deals with Nazareth’s rejection of Jesus. God-induced Good-Byes -- Genesis 12. Spiritual men cannot stay at the level of the carnal man. You must leave Ur. The Song of the Vineyard -- Isaiah 5. Sacred Secrets -- The kingdom parables of Matthew 13. Here are a few of the titles from that series: When the Devil Goes to Church (the wayside), The Religious Rollercoaster (the stony ground), A Saga of Spiritual Strangulation (the thorny ground), The Fruit-Bearing Friends (the good ground), Spiritual Subversion (the wheat and the tares), and The Ecology of Evil (the leaven). The Crucible of Character -- A take on Jacob. How to turn a crook into a saint. This is accomplished in two ways, first God will cripple him and then God will crown him. Tim Kelley, a friend of mine who pastors in north Louisiana, put me on the track of this book. I have read this book through twice and have pulled it down numerous times and re-read different portions. It basically tells a story about a pastor who finds his church complaining about his preaching. The pastor is to the point of giving up when he runs into an aged and now retired former seminary professor. They begin working toward re-generating a burnt out pastor and his preaching starts ministering again. Wide Range of Reading -- Follow the six-track path (novels, history, biographical, diary/journal, poetry, “hot topics”). Gathering Illustrations -- Always look at newspapers, periodicals, now the Internet (which basically was in it’s infancy when this book was written 1997). Recruit the help of the congregation in gathering stories that might fit into some of the sermons. Practice Self-Evaluation -- Listen to yourself on tape or video. Ask for help from your spouse or another fellow minister. Critique your voice. Timing of message (I have severe trouble with this). 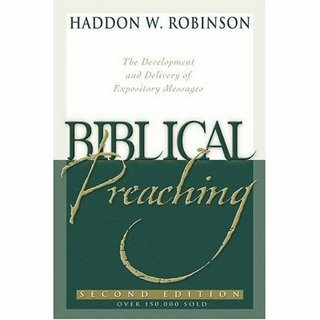 Study Great Preachers Sermons -- Books of sermons from the past. Refer to E. E. Jolley’s recommendations. Talk to “old” preachers because they can put you on the path of obscure and often forgotten preachers of the past. 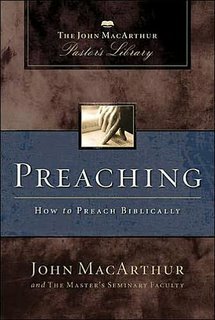 Read one good book on preaching every year. Attend refreshers, seminars on preaching, or enroll for a D. Min. 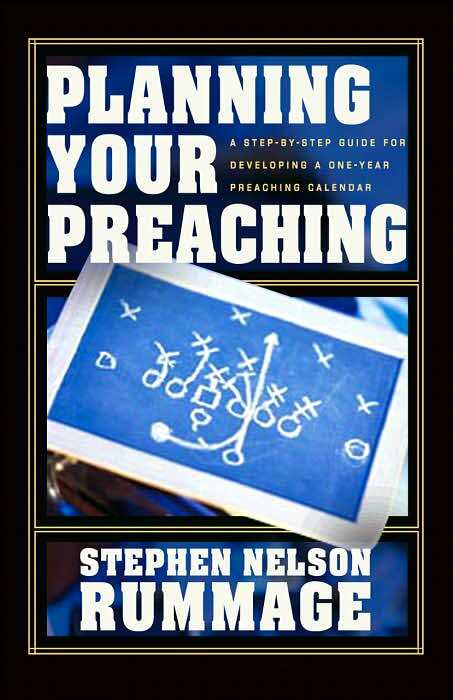 Plan a sermon series a year in advance. Carry a copy of the series schedule in the front cover of your Bible. Let “iron sharpen iron” with discussions with fellow preachers. I know that books like these scrub against the grain for a lot of Pentecostal preachers. Yet, I believe that this kind of thing can actually help promote great spiritual health in congregations. Our age is marked by an incredible famine of the Word (Amos 8:11). I honestly read this book because I did not agree with the concept. Yet, I will say that the author had some very strong arguments (which were very convincing) for planning what you are going to do. Initially, this probably will work best for mid-week services. Then if the Lord strikes you with something that is absolutely a necessity to be preached then go with that. However, if we pray about this process, I truly believe that God can guide us in the direction that he wants us to go. I strongly recommend this book but I have somewhat of a disclaimer to go with the recommendation. It is a bit technical and some portions of the book reminded me of a high-school English class where we were diagramming sentences. This is exactly what MacArthur and the Masters Seminary contributors do with this book. It actually is a seminary text that has been published for ministers. I highly recommend the segment in this book that deals with prayer and with the character of the minister. This is an old classic. It actually began as a series of lectures that were given by D ML-J and then was transcribed into this book. This was one of the text books my senior year at Texas Bible College. It is a bit dated but it still has some very good points to make concerning the ministry of the Word. This is one of the books that I “accidentally” found and it ended up being a very profitable time for me. It reinforces the thought that preaching is still very important in the life flow of a church. It also really homes in on the idea of sermonic application (which sometimes is a weakness of my own preaching). He brings out the fact that for the congregation to grow (not so much numerically as spiritually) that the preacher has to be committed to his own spiritual growth also. 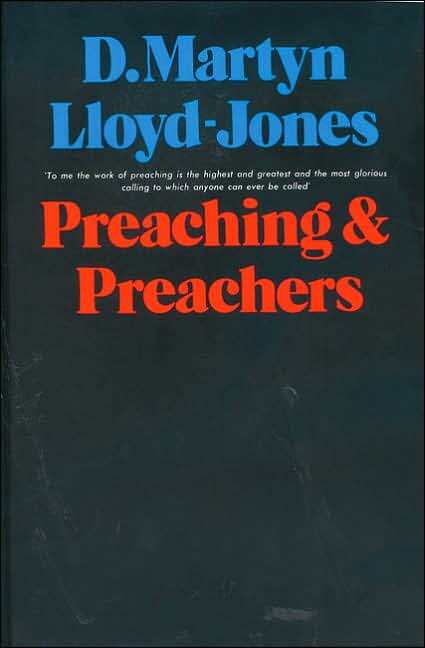 He even recommends that periodically (once a year) that the pastor preach a sermon on preaching. 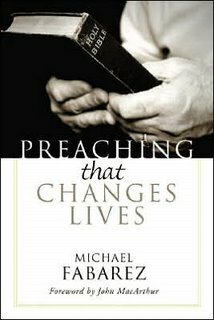 He devotes a chapter (Come to Grips with the Time It Takes to Prepare a Life-Changing Sermon) to a minister’s schedule. There are “crock pot” messages and then there are “microwave” messages. The “crock pot” stuff is always the best. Sorted erasers of different kinds. Oops! To late, it’s time to quit! This is not a time management book but the author does spend an entire chapter forcing us to concentrate about where our time is going and how our lives are being spent. Calvin Miller writes a little story about Pastor Sam and Emma Johnson. Emma is Sam’s worst and most vocal critic in the church he is trying to pastor. She stirs up more difficulties for Sam than he can shake a stick at. She saves her most critical words for Sam’s preaching. Sam is on his knees having more of a pity party than a prayer meeting when Sermoniel, the Angel of Homiletics shows up (sent by God) to help poor Sam with his dilemma. This is a funny little story but the neat thing about it is the layout of the book. 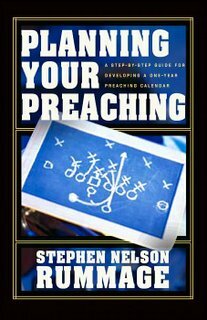 The story is told on the right side of the book and on the left side of the book there are massive amounts of comments that serve as “coaching” that arises from the advice the Sermoniel gives. The book ends on a high note with Sam and Emma. 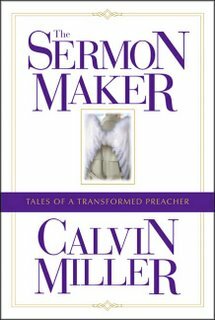 You will find this helpful little story to be funny but also some very arresting homiletic principles are brought out by Miller. Miller teaches at Beeson Divinity School located within Samford in Birmingham, Alabama. You will get a lot of bang for your buck with this book. It is almost 400 pages long and has a smaller font and is packed with good leads and profitable instruction about the nuts and bolts of putting a sermon together. The only draw-back in this book was the strong lean toward alliteration. I personally do not care for alliteration but there are some who really enjoy this type of preaching. I have a friend in Louisiana who is very good at it and has used it incredibly well with preaching to the youth. This book is a very basic handbook to homiletics. 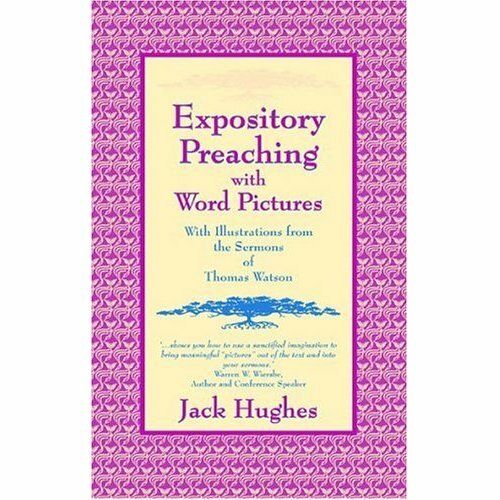 Some would think this book is very elementary in its presentation but it would be a very good book for anyone who is just beginning to preach. Dr. Ockenga (a man who preached to Piper in a college chapel) never knew what his preaching did in my life, and you can mark it down that if you are a preacher God will hide from you much of the fruit He causes in your ministry. You will see enough to be assured of His blessing, but not so much as to think you could live without it. For God aims to exalt Himself, not the preacher. 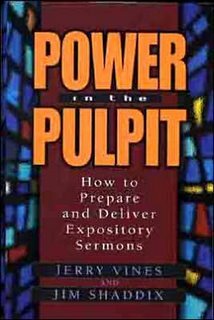 This book explores the preaching, preparation, and some of the sermons of Jonathon Edwards. This is another book that basically is a textbook on preaching. There are a lot of mechanics in this book. What I mean by that is it is very heavy on the “how-to” of putting messages together. However, with the “how-to” of this book, some of the steps that it suggests that you walk through in looking at the text you are preaching from are very helpful in adding some meat to the bones of your thought that has been impressed on you. Furthermore, it is not light on forcing the preacher to pull biblical truth into the frame of the message. This is very important! I frequently look in the paper and see the sermon titles and series of churches around my city. I am becoming more and more amazed that most of these sermon titles are inferring that stress management, financial planning, how to be happy, and parenting are replacing biblically driven messages. Ever so slowly, the Bible is being squeezed out of the secular sermons. If you do not believe this, then I ask you to do a little experiment. Find the books of sermons that were written in the 1950-70’s and really earlier than those dates and you will find a remarkable change. 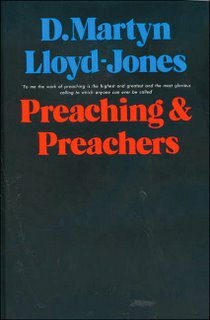 Those older sermon books were centered on God and His principles, new sermon books are centered on man and his desires. 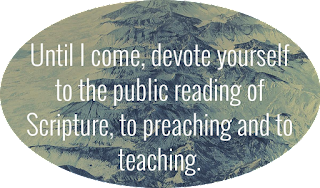 Romans 1 appears to be encroaching into the current preaching. 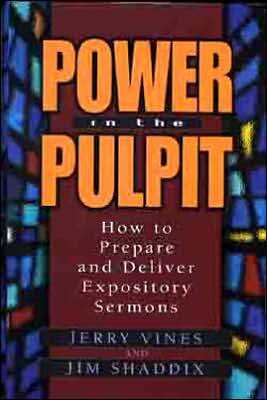 Power in the Pulpit is a strong call back to the biblical text and it’s establishment of truth. 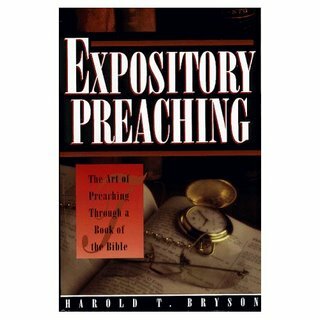 This book was a textbook for a class that I took on Expository Preaching. I practically filled up one “marble” notebook with notes on what Chappell wrote about. It is a very good book although there are some places that it can be very dry. That is the way the process goes sometimes, you are never in a harvest mode all year long (at least I am not). Chapter 7 is entirely spent on how to use illustrations and most importantly how to gather illustrations. Another strong value of this book is that it is heavily foot-noted. Blessed is the preacher who loves footnotes for they shall open up many paths (Barnabas 9:14). I made that up but there are great treasures available to the man who will run down the footnotes and do his homework. 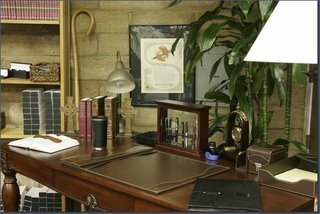 Sweat in the study can give an added edge to the sermon (Barnabas 3:20). This book is absolutely magnificent. It has a great flow to it however the clincher for me was all of the quotes in the appendix from the writings of Thomas Watson. They were great stimulants to produce thoughts for messages. Here is a sampling from the smorgasbord. Preaching -- Many love the Word preached only for its eloquence and notion. They come to the sermon as to a music lecture (Ezekiel 33:31-32) or as to a garden to pick flowers, but not to have their lusts subdued or their hearts bettered. These are like the foolish woman who paints her face but neglects her health. Providence -- The most dark, cloudy providences of God have some sunshine in them. What a blessed condition is a true believer in! When he dies, he goes to God; and while he lives everything shall do him good. Affliction is for his good. What hurt does the fire to the gold? It only purifies it. Repentance -- Those who are not bruised penitentially shall be broken judicially. Those whose hearts would not break for sin shall break with despair. In hell there is nothing to be seen but a heap of stones and a hammer. A heap of stones—that is hard hearts; a hammer—that is God’s power and justice, breaking them in pieces. Sin -- Sin first tempts and then damns. It is first a fox and then a lion. Sin does to a man as Jael did to Sisera. She gave him milk, but then she brought him low. Sin first brings us pleasures which delight and charm the senses, and then comes with its nail and hammer. Sin does to the sinner as Absalom did to Amnon. When his heart was merry with wine, then he killed him. Sin’s last act is always tragic. In conclusion of these recommendations, remember that you can never get beyond praying over your preaching, praying over your studying, and praying over your preparation. Summer is winding down and although we will still have several weeks of warm weather, school has started back thus ending “summer.” While most of us enjoy those somewhat lazy days of summer that come with school being out, the older that I get the more that I realize that sometimes the summer season can cause a loss of focus. When school starts back, many churches begin to see their attendance creeping back up because, for the most part, all of the traveling days are over. The routine of the schedule actually gives great stability to order in life. I can remember that during the summer vacation, Mark and I would always go and spend a couple of weeks with my grandparents over in Andalusia, Alabama. We would spend a week at the beginning of the summer and one more at the end of the summer just before school started back again. My grandparents lived on a farm although when we went because of their age, they no longer actively “farmed” as they had done in the past. However, there was still a “farm” atmosphere because they still had chickens, cats and dogs, and huge gardens. Along with all of this, there were pear trees to harvest, tomatoes to can, blue berries to turn into jelly, and all of the other things that seem to go along with simple, country living. While the work was hard, there was something about the whole atmosphere that seemed to encourage good, clean living. Early mornings were always a treat. Mark and I were accustomed to cold cereals (Cap’n Crunch Peanut Butter flavor was always my favorite) and Pop Tarts for breakfast prior to school. But in Andalusia, my granny always had a “real” breakfast that included bacon or sausage, grits, eggs, biscuits, coffee (which I did not drink then), milk, and OJ. Generally speaking, this spread was usually ready to eat around 6:30 AM. In my young mind, that was way too early to be getting up on a summer morning. Yet, with that discipline of early rising, you were able to attack the day, instead of it being the other way around. After the breakfast table was cleared (usually before 7), a flurry of activity begin. Since my granny was still cooking with a wood burning stove, “kindlin’” was still needed every single day. That was one of the chores left for my Papa. So as he got involved doing his jobs, my Granny would set about doing the things that she was obligated to do. Her responsibilities generally involved taking care of a huge garden. To shield her from the sun, she would put on this large bonnet that had ties and would head to the garden with variety of garden tools like hoes, rakes, small shovels, and a small “washtub” was they were called. She also would take with her a “push-plow” which was the thing that always captured my interest. There were times that she would begin with picking some of the produce from the massive garden. There were peas, butterbeans, tomatoes, squash, string-beans, and egg-plants. Other times she would begin by pulling the weeds out of the rows of the garden. All in all, her garden was always the neatest and cleanest that I have ever seen. Another exciting thing for us to do was to feed the chickens. We would take a few ears of corn and go into the chicken yard and rub the corn on a tree and the old corn would chip off and fall to the ground. It seemed as if this production would cause a hundred chickens to gather up around your feet and eat this corn that was falling to the ground. Along with feeding the chickens, we also were able to gather the eggs. I would guess that at least a dozen eggs were gathered up every day. Because there were so many eggs, my Granny would give them out at church. She would give them to the neighbors who lived across or down the road. She gave eggs to my great grandmother who lived just around the bend. In retrospect, I can now see why that a lot of eggs were used in cooking around her place. While she was busy with this, my Papa would be cutting wood, mowing grass, or cleaning a fence-row. The mornings were filled with sweat and work. With this sweat and work, there always seemed to be order that gave way to an informal schedule that they had followed for years. Mondays were wash days. Tuesdays were spent in the “fruit” house which was a smaller building down behind the house that had shelves from ceiling to the floor. On these shelves were multiple Mason jars that contained “canned” fruits and vegetables. They would can more vegetables, fruits, or jellies on this day. Wednesdays were meant to “go to town.” Since they lived out in the country, the 10 mile trip to town was a big deal. Thursdays were spent visiting. Jesse Bradshaw would come by in the morning and she and my Granny would sit on the front porch and talk and swing. Much of their conversation was always about God, Scripture, and His provisions for the simple things in their lives. Uncle Julius would drive up after lunch in a 1940’s vehicle of some kind (this was the mid seventies) and they would spend half the afternoon seemingly talking about their main concern which was getting home before dark. Fridays were spent picking up around the yards and house in case some visitors came by on Saturday or Sunday. Around eleven in the mornings, my Granny and Papa would begin to make their way back to the house. At the “back porch,” there was a place to wash up at a sink. I can remember the water being very cold as it ran out of the spigot into the sink. There wasn’t a fancy handle, just a pipe coming out of the wall that ran through a brass spigot. In the sink was a wash basin that remained for all of my years going over there during the summers. Hanging from a small towel holder on the wall was a towel that somehow always remained clean no matter how dirty that we were. There was also a “dipper” hanging from a nail in the wall that served as a community container for anyone who desired a drink. Everybody drank out of it. You would simply take it down, help yourself and then hang it back up. Amazingly, I do not remember ever getting sick drinking behind someone else. Lunch, or dinner as they called it, was a huge production, even more so than breakfast. Fried chicken, mashed potatoes, garden vegetables, fried “hoe-cake” and sweet tea every day! My Granny had another tradition while she was cooking and that was listening to WAMI from Opp, Alabama. Every day, she would turn on the radio at eleven and listen to the “Golden Agers” which was a local program that mixed local events with southern Gospel music. Not this Suthron fake Gospel stuff now but real Suthern Gospel. They would play the Chuck Wagon Gang, the Inspirations, Wendy Bagwell and the SunLighters, The Happy Goodman’s, and some group that would sing the notes to the songs (Fa, Ra, Do, Si, etc.). Then we would eat! All of this food was accompanied with home-canned pickles, relish, hot chow-chow from peppers, and sometimes my Papa would put syrup on his butterbeans. After this, the table would be cleared, dishes washed and dried, left-overs put in the safe. The safe was an upright cabinet that had screen doors on it. Several shelves were present and all of the food would be put into the safe and small clean handtowels would be placed over each bowl or plate to protect it from any flies if they managed to get into the cabinet. If someone happened to show up in the middle of the afternoon and wanted something to eat, it would not take long before a feast would be sitting before them. As all of this “dinner” business was completed, the most important part of my Granny’s day would begin. My Papa would retreat to his bedroom for a two or three hour nap and my Granny would go out the back door and go down to her “prayer” house as she called it. This little building was perhaps 8X12. The walls were not paneled. She had collected cardboard boxes from the Quik Chek grocery store in Andalusia and had turned the boxes into paneling. She then had whitewashed the walls and it had worked well although in a few places you would see where a brand of cereal or paper towel had not been totally covered. 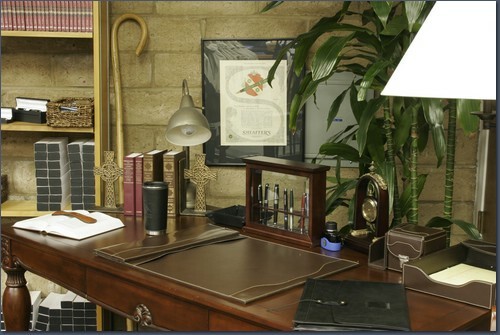 In that little room, was a pew, an upright piano, and a bulletin board. On the bulletin board there were literally hundreds of pictures. Some were school pictures, family portraits, and some were polaroids. I can remember that she would make Mark and I go with her to pray. She would always start by sitting down at the piano and singing usually one song out of a worn out hymnal. Then she would read a portion of Scripture from her Bible and then she would settle in to pray. The praying was always what took the majority of the time. I would try to pray but there were so many much more “important” things that were calling for my attention back then, that I usually did more watching than praying (I was living up to the watch part of the Scripture where we are commanded to “watch and pray.”) My Granny would get up and pace and then get back down on her knees. Some days, the prayer was entirely in tongues (Acts 2, etc.) and other days she would pray without ever speaking in tongues. Whether she prayed in the Spirit or not, her prayers were always weighty, provocative, and powerful. She would also stand for long periods of time in front of that bulletin board and roll name after name off in prayer. Time would pass rapidly for her and not so fast for Mark and I. It was nothing for her to spend 1 ½ to 2 hours in prayer, every single day of the week except for Sundays. Sunday was the only day that she did not go to the “prayer” house. The memories of those summer afternoons will periodically replay themselves out in my mind as I get older. I can only wonder how many total hours of her life were spent in the place of prayer. Furthermore, knowing the power of prayer, I can again only wonder how much impact that her prayers are having on the revival that many are enjoying today. I have said on numerous occasions that prayer is hard work and yet the impact of this “work” is the most prevailing and under-used weapon available to the church today. 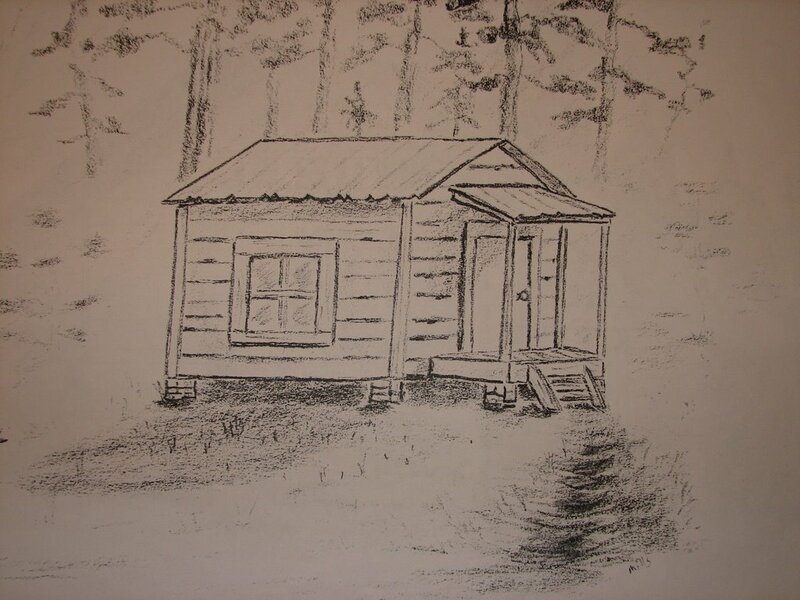 The image of the “prayer” house was drawn by my second cousin, Kenny Daughtry. He was my Granny’s nephew.